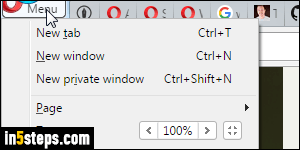 Click on the Opera button (top left corner) and choose Settings in the menu. 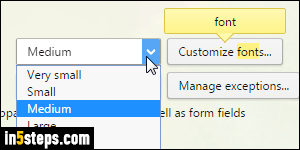 In the search box at the top, type "font" to quickly show only the relevant options. Notice that all matching settings are highlighted in yellow. 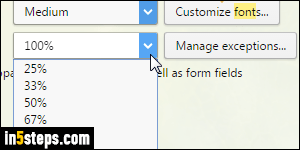 The default text size is "Medium": click on the Font size dropdown to pick a larger -or smaller- default size. Clicking on the Customize fonts button on the right gives you even more granular control, by letting you pick different settings for different types of fonts (serif, sans-serif, fixed-width). That popup even lets you tell Opera to enforce a minimum text size for all web pages! Although it's separate from font settings, the Page zoom dropdown controls default zooming: unlike font settings, the zoom option is applied to the entire page. 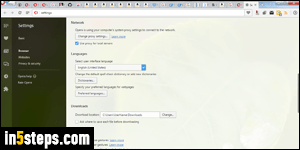 In other words, instead of just making the text larger or smaller, Opera can make the whole page, including images and videos, larger or smaller. You can even set exceptions for website you want to exclude from that rule!